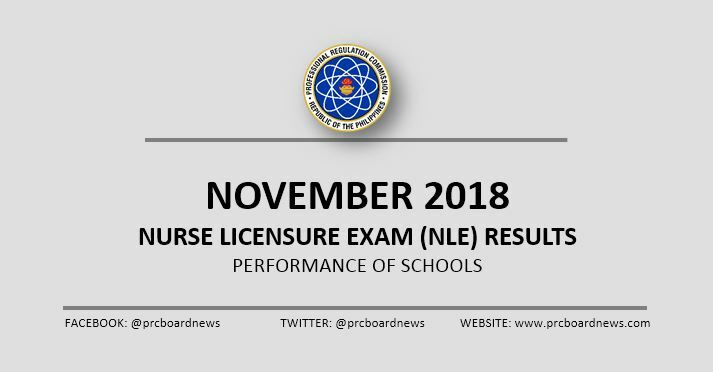 MANILA, Philippines - The Professional Regulation Commission (PRC) recognizes the top performing schools in the November 2018 nurse licensure examination (NLE) or nursing board exam. The result was released today, December 7 or in 14 working days after the last day of examinations. PRC administered the nurse licensure exam in Manila, all regional offices nationwide (Baguio, Cagayan De Oro, Cebu, Davao, Iloilo, Legazpi, Lucena,Pagadian, Tacloban, Tuguegarao) and Zamboanga on November 17 and 18. In the November 2017 exams, University of Santo Tomas (UST) dominated with 100% passing rate. Saint Louis University (SLU) ranked second with 99.39%. In the November 2016 NLE, UST and Benguet State University - La Trinidad were the top performing schools with 100% passing rate. Southern Luzon State University (SLSU) - Lucban and SLU were among the top performing schools. I regularly visit your site and find a lot of interesting information. Not only good posts but also great comments. The board wouldn’t publish anything because it really isn’t anyone’s business Buy Essay Online other than the people who were violated, the place of work, and probably Ashley.